Guide and information of Japan travel, with New Japanese Vending Machines at JR Stations. Followings show some possibilities of your passive income. Why not operate 5 - 10 vending machines, plus coin-operated laundry shop, so that your pension is secured, much better than relying on your government?! Before talking about drink vending machines, here's new type of laundty machine just south of Asakusa. You'll be informed by e-mail when the washing/drying cycle is at an end, so that you won't need to wait too long. Or, watch TV and read Manga while you are waiting yours/others cleaning. Maximum 16kg can do at one shot with electrolytic water which has less impact on environment. Nearby Tokyo Ryokan has even bigger scale machines => ASA. There are more than 5 million vending machines all over Japan, and about 50 percent of which is for drinks (including soft drinks and beer). Easy calculation would say that there is 1 drink vending machine for every 40 people. Number is enough, but here's the high technology version with touch-panel, iPad style! Solar powered vending machines, touch screen vending machines, e-money (ic touch card) vending machines, 15 languages vending machines and more. 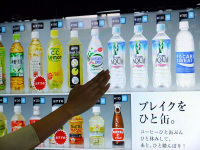 One vending machines now can produce 112 different taste to quench your thirst. In 2017, Seven Eleven sold more than 1 billion cups of coffee all over Japan. Known Seven Cafe has been doing good business, other convenience stores followed. Lawson has Machi Cafe, Familymart has Ajiwai Famima Cafe, Circle K Sunks has Iretate Coffee, Mini Stop has M's Style Coffee. There is no doubt that Japan imports tons of coffee beans. No.1 importer USA, No.2 importer Germany, No.3 Japan! Can of coffee? or Convenient coffee? New style drink in Japan. Kirin produce not only beer. Asahi beer? or Asahi soft drink? New taste of Japan CAN do. JR is installing new high-tech vending machines throughout their railway lines. Touch screen panel (yes, just like your iPad and iPhone) shows what you need to drink when you stand in front of the computerized machine. How would they guess which drink you would prefer? There is a camera installed which would detect and assume your age and gender, based on their rough (sometime accurate?) judge, they will introduce you the best appropriate drink. You may get beer?! 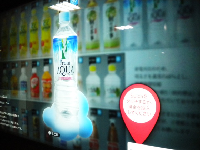 Just touch it on the monitor, and swing your Suica Card, you'll be happily fulfilled by the liquid. Due to possible power shortage, they may NOT be operating 01:00AM - 05:00AM in some area. Under the circumstances of all the 50 nuclear power plants are under maintenenace or shutting-down process, only 60 percent of full blast is needed to operate the new vending machine compare to the old machine, yes, save energy sell more drink!